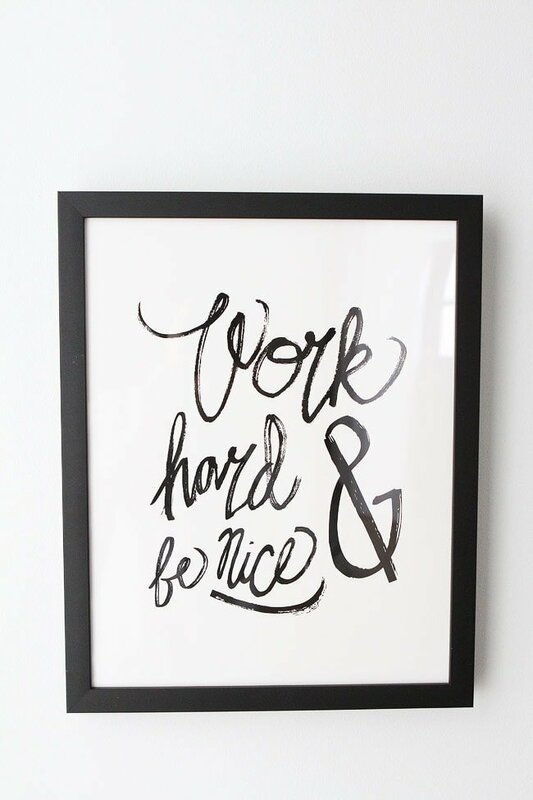 Our family motto is work hard and be nice so when I saw this print at Minted I had to buy it for the house. It hangs on the wall in the mudroom so we can see it when we walk out the back door. 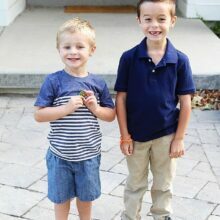 The boys love yelling, “work hard and be nice.” It’s a good reminder every day. By our back door, outside the laundry room, we have a drinking fountain for the boys and a Dutch door. I love Dutch doors and it was another MUST on my list:) The door color is Tricorn Black by Sherwin-Williams, my favorite black. All of our interior and exterior doors are this color. I am SO glad we went with black inside and out! All of the white paint is Extra White by Sherwin-Williams. It might be a little weird to show you our bathroom, but we are all friends here. I have nothing to hide:) I love how our guest bathroom turned out. 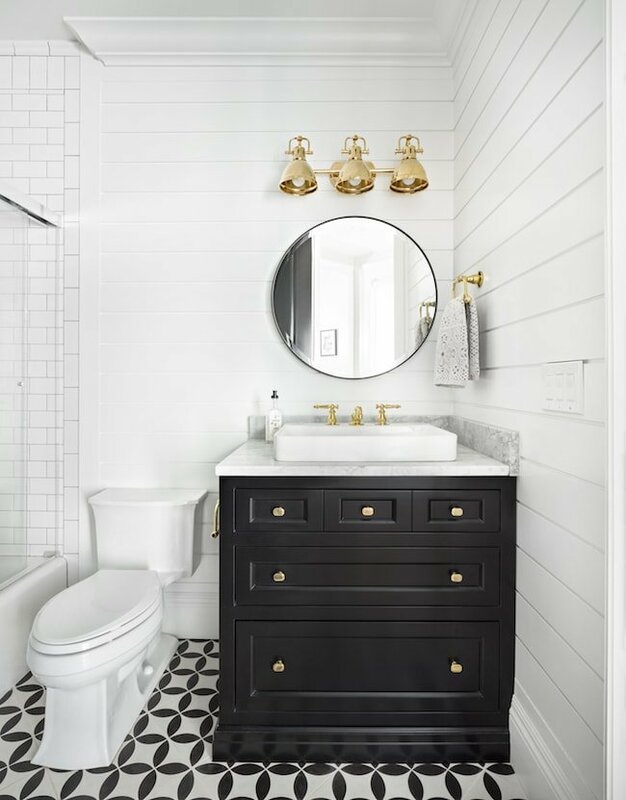 The black and white tile from Cement Tile Shop is my favorite and I love the brass accents with the black. That’s it for today friends! Thanks for going on another tour with us. Enjoy the rest of your weekend! You can view our complete house tour here. House built by The Fox Group. Thank you to the following brands who partnered with us on our house: Kohler, World Market, Minted, Sherwin-Williams, and Hygge & West. This post contains some affiliate links! Your home is beautiful. Love the molding in your mushroom cabinets. I want that laundry room!! My daughter had a very similar floor tile in her previous home…looks really nice. Your whole house is beyond beautiful! Thanks for sharing with us. Have a fantastic Sunday! You are welcome! I am glad you are enjoying our house tour! I have been eyeing that wallpaper – I love how happy and fun it is! It’s all beautiful, Maria! The wallpaper is my favorite! You need to come over! 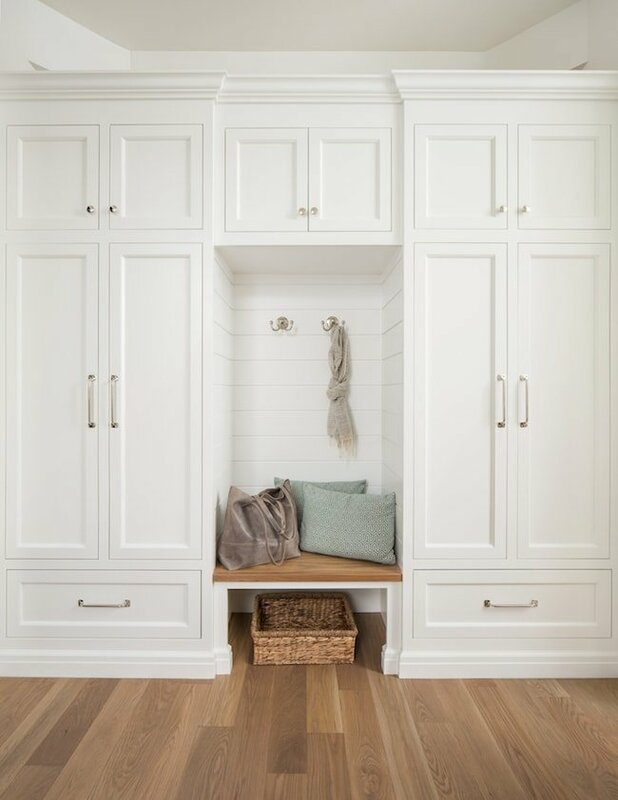 Okay..it’s official…I would kill for your mud room and laundry room Such a great idea with the lockers for everyone…so much neater than the freaking shelf with coat hangers that we have. You and Josh have done such a great job designing your house! It truly is functional, comfortable and beautiful. Thanks so much! We are loving our new home. Everyone having their own locker is possibly the best idea ever. And the drinking fountain is so neat! It’s not something you’d normally think of in a house, but with kids, it makes perfect sense. I must get my hands on some of that wallpaper, I love it! I bet your house is super cool from top to bottom. The wallpaper is SO fun. I love it! Thank you! Thank you for showing your home. I just love it. I believe those Dutch doors are becoming very popular once again, would really like to have one! The first time I saw a dutch door was on a TV show I used to watch called Mr. Ed, loved that show and I am telling my age! Who cares, right? Can you please tell me if the bathroom vanity is painted in Tricorn? Thanks. We are loving our Dutch door. Yes, the vanity is Tricorn black too! It is my favorite black paint! Love all your ideas! I am planning our retirement home so getting any ideas I can. I notice you don’t have rugs in your bathroom. Do you miss them? I am considering ditching mine. Tired of washing them all the time! We have one in the boys bathroom, but I don’t miss the other bathrooms. I would love to see your floor plan. Will you share? I love how well thought out everything is. It is beautiful! Love the water fountain! Wish I would have thought of that when my kids were little. Genius!!! Beautiful :), love the idea of mudroom that is something I have to think about too. And the wall papers are really cool! Your home is so beautiful! I have serious pantry envy! As a mom who has five kids 11 and under I have to say a mudroom is a must. Most of the time the kids still throw their stuff on the ground but it’s super easy to turn them around and have them place things neatly in their cubby when it gets too messy! Also the bubbler (a water fountain to most of the world) is genius…pure genius. Now we have a water bottle system that seems to only work half the time…I am SO jealous. The laundry room is beautiful! I am curious about your kitchen. How do you use the double islands? Do you tend to always work on one or do certain things on each? I’ve seen that before and have always been curious! I love your home, you guys did a wonderful job with the design. We are building a new home next spring, we are in the middle of looking at house plans, would you mind sharing your floor plan? 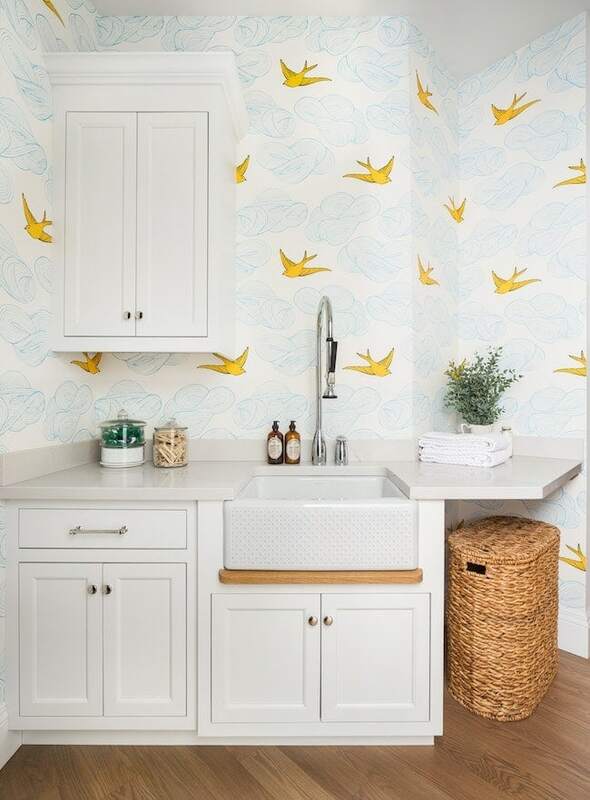 I am seriously in love with this laundry room/ mudroom over! What a smart idea with the drinking fountain and I love the dutch door. I know you are a food blogger but I find your house very inspiring. 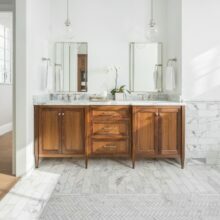 Would you consider posting more room tours of your house such as you patio area, bathrooms, etc?